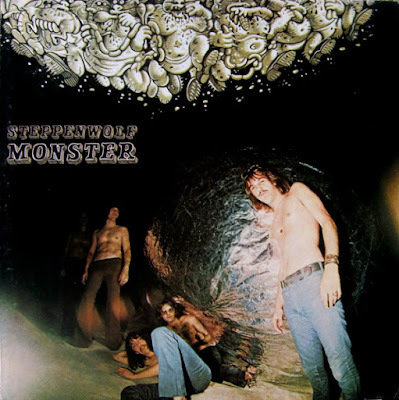 “Monster,” Steppenwolf’s fifth LP, fourth from the studio, was released in November 1969, a mere four months after “Early Steppenwolf” a live set recorded May 14, 1967, while the band was still performing under their original moniker, Sparrow. 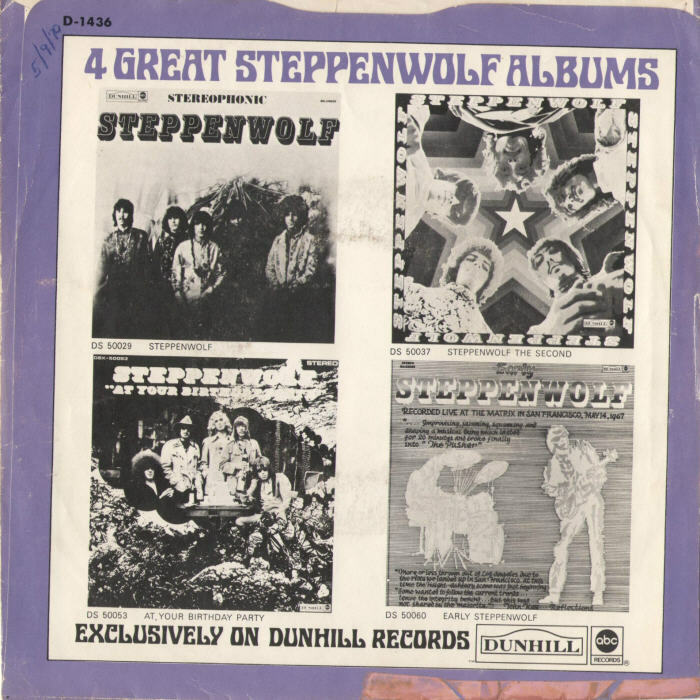 Consisting of seven tracks, highlighted by the opening, nine minute, fifteen second, medley, of which the title track was the opening section, it was Steppenwollf’s most political album and their first to not make the Top 10 on the Billboard charts, peaking at #17 in early 1970. 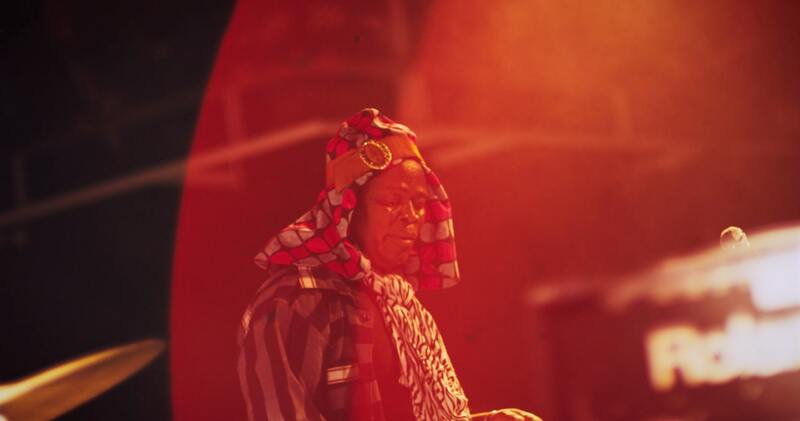 The long player did include two Top 40 singles, “Move Over” released in mid-August 1969 that reached #31 and the title track, released in late December 1969, which eked in at #39. “Monster” was the first album to feature former T.I.M.E. (Trust In Men Everywhere) members Larry Byrom on lead guitar and Nick St. Nicholas on bass guitar. St. Nicholas had appeared on the band’s fourth LP, “Early Steppenwolf” but that recording, as previously mentioned, was actually the work of Sparrow, the pre-Steppenwolf band which St. Nicholas was the band leader and bassist of. 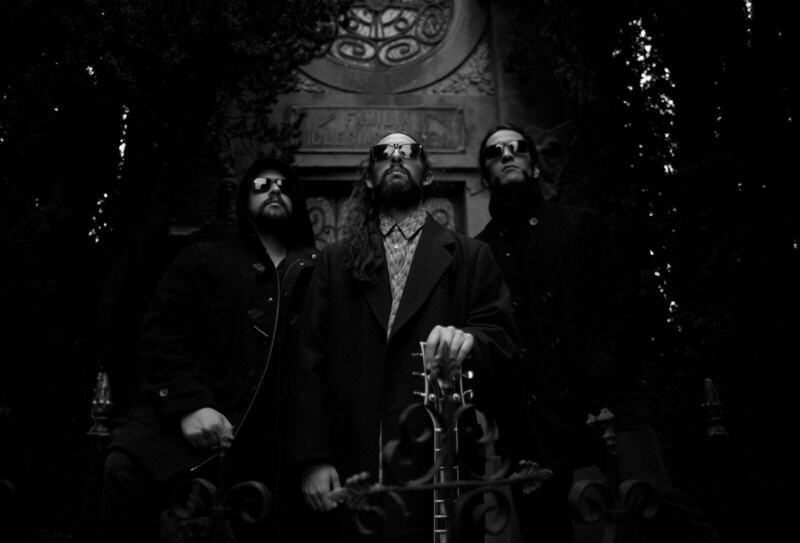 The nucleus of vocalist/rhythm guitarist/harmonica player John Kay, drummer/vocalist Jerry Edmonton and organ/piano player Goldy McJohn remained. Thus, guitarist Byrom aside, “Monster” was the work of Sparrow, guitarist Mars Bonfire (Dennis Edmonton) the only member missing from the Canadian based quintet which recorded a couple of singles in 1966, and who relocated to Los Angeles at the urging of Gabriel Mekler, who got the band a recording contract with ABC/Dunhill Records, resulting in the release of their debut single “A Girl I Knew” b/w “The Ostrich” in 1967, and their s/t debut January 1968 LP which contained both sides of the single, along with nine other tracks, including the band’s signature tune “Born To Be Wild” penned by guitarist Bonfire, and the album and related singles having previously been the focus of The Steppenwolf Story-Chapter One recently published here in It’s Psychedelic Baby Magazine. “Monster” opens with the medley “Monster/Suicide/America” a nine minute plus opus, penned by Kay, Edmonton, St. Nicholas and Byrom. An incredible piece of social commentary, the songs sections address the nation building of the United States, as a refuge sought out by “the religious, the hunted, and weary chasing the glimmer of freedom and hope” as Kay points out in the tune’s opening verse as the nation’s founders “came to this country to build a new nation, far from the reaches of Kingdom and Pope.” Incredibly insightful social commentary which fills the lyrics of the title track as Kay continues with his cautionary observation, “like good Christians some would burn the witches, later some brought slaves to gather riches.” The song tells the tale of westward expansion and the building of railroads from coast to coast, incredible achievements but coming at great cost in the loss of lives among Native Americans and Asian immigrants, among others. “And when the ties with crown had been broken, westward in saddle and wagon it went, and till the railroad linked ocean to ocean, many the lives which had come to an end.” Kay’s commentary moves from the Civil War which nearly destroyed the nation, through its bountiful natural resources which led to economic prosperity, the suffering of the Great Depression and the survival of two World Wars, setting the stage for even greater prosperity and eventually he focuses on the civil unrest of the 1960s, due in large part to the then thriving, controversial war in Vietnam and the intrusion of the United States government (Kay’s “Monster”), namely the Nixon administration into the lives of mainstream America, both of which were the topics of much of Kay’s best social commentary, “the spirit was freedom and justice, its keepers seemed generous and kind, its leaders were supposed to serve the country, but now they don’t pay it no mind, cause the people got fat and grew lazy, now their vote is a meaningless joke, they babble about law and order, but it’s just the echo of what they’ve been told, yes a monster’s on the loose, it’s put our heads in a noose, and just sits there watching, the cities have have turned into jungles, and corruption is strangling the land.” Kay warns about the use of force by the government on the citizens and the imposition of American values on nations around the world, “the police force is watching the people, and the people just can’t understand, we don’t want to mind our own business, the whole world has to be just like us, now we’re fighting a war over there, no matter, who’s the winner we can’t pay the cost.” The song closes with its familiar, repeated chorus of “America, where are you now, don’t you care about your sons and daughters, don’t you know we need you now, we can’t fight alone against the monster.” The song, which was hailed by many as the best anti-Vietnam War song of its day, was, as indeed the entirety of “Monster” viewed by many in rock journalism, Rolling Stone to name one, as being preachy and heavy handed, although others such as Robert Christgau gave the album a B+ rating and called it “an excellent comeback” apparently referring to “At Your Birthday” which, as pointed out in its previous review here, was a drastic contrast to Steppenwolf’s previous work in its lack of social commentary and its movement away from the psychedelic sounds of “Steppenwolf” and “Steppenwolf The Second” with its more hard rock sound and direction. The musical performance contained in “Monster” includes contrasts between hard rocking sections with Byrom’s guitar flaming and McJohn’s familiar Hammond organ joined by St. Nicholas’ thundering bass and Edmonton’s driving drum beat and the more subdued segues between the song’s sections, which are highlighted by Byrom’s guitar and McJohn’s repeated organ riff. An epic ode regardless of one’s feelings toward Kay’s political stances, “Monster” stands out in the Steppenwolf catalog and is viewed by many as just as timely in 2018 with the civil unrest under the Trump administration as it was nearly half a century ago when Richard Nixon inhabited the White House and huge rifts existed within American society, a true to testament to the adage that “history repeats itself,” while others would posit that indeed “some things never change.” But, there are six more songs to be discussed and so onward we go. “Draft Resister” a three and a half minute rocker penned by Kay, McJohn and Byrom, is a most compelling piece of social commentary. From its opening verse, where an army deserter in Sweden discusses how he joined the military to seek adventure and prove his manhood, only to have an attempt made to kill his conscience and to turn him into a traitor against humanity as he warns young Americans to “Heed the threat and awesome power of the mighty Pentagon which is wasting precious millions on the toys of Washington” a warning many would say is absolutely as real now as then. Kay contemplates the plight of those caught up in the Vietnam War and the difficult decision they faced in his profound observations, “Don’t forget the draft resister and their silent, lonely plea, when they march them off to prison, they will go for you and me.” This was the plight that faced not just John Q. Public but even the wealthy and famous as evidenced by the experiences of Muhammed Ali, who was jailed for a time while seeking “conscientious objector” status. A difficult decision, at best, one which does not face the youth of America today with our all volunteer military, but was once front and center in the mind’s of many young men. Ponder, if you will, the ability of such future leaders as Bill Clinton, George W. Bush and Donald Trump, among others to avoid serving in Vietnam, while others such as John McCain, John Kerry and Robert Mueller decided to actively participate in the war. Kay finishes the song by summing up the harsh reality facing those who chose not to serve, but were unable to attain deferments or conscientious objector status, “shame, disgrace and all dishonor, wrongly placed upon their heads, will not rob them of the courage which betrays the innocent.” The commentary of “Draft Reister” is accompanied by a rather subdued instrumental performance highlighted by Byrom’s guitar and Edmonton’s drums, with Byrom supplying an inspired solo and tasteful lead line. The tune is a gentle, almost jazz like performance by the quintet. “Power Play” is a hot rocker from the Sparrow days, which includes even more insightful social commentary by Kay, discussed on the earlier published review of “Early Steppenwolf.” The discussion of the political power being wielded by the government is joined by some incredible guitar by Byrom, with Edmonton’s drums keeping the beat, The band turns up the heat for the final two and a half minutes, with Byrom’s guitar blazing and McJohn’s organ swirling all around. Containing not one, but two incredible solos by Byrom, “Power Play” is Steppenwolf at their hard rocking best. Side two of the album opens with feedback from Byrom, and McJohn’s piano, the combination of the two bringing Randy California, circa “12 Dreams” to mind at once, as the band rocks through the snappy, just short of three minute tune, a #31 hit, which deserved an even better fate. Byrom shines throughout, with Edmonton’s pounding drums forcing the beat, and Kay’s vocals roaring over the top. McJohn’s piano introduces the non-politically correct titled “Fag” written by Byrom, St. Nicholas, and Edmonton. McJohn’s organ carries the instrumental for the most part, with his gentle, insistent piano mixed underneath. Edmonton keeps time locked in with St. Nicholas’ bass. A most pleasant tune, Byrom’s guitar is restrained throughout, as it is McJohn’s show, start to finish. A cover tune “What Would You Do “ has more than a hint of funk, with McJohn’s organ and Byrom’s guitar rocking. Kay’s almost spoken vocals, joined by female background vocals, are a nice touch. The band puts itself through its paces, with Byrom’s guitar and McJohn’s organ again at the fore. A three and a minute rocker, Steppenwolf displays their musical chops, and they shine. The album closer “From Here To There Eventually” written by Kay, McJohn and Edmonton, is more hard rock from the band, with female backing vocals again added, but it is Byrom’s guitar, McJohn’s organ and Kay’s roaring vocals that are on display. 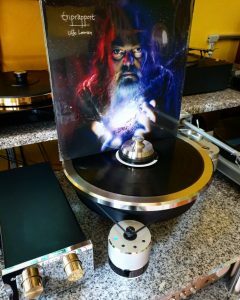 The five and a half minute track gives the band a chance to relax and settle into a most pleasant groove, with Byrom’s solo, at the three minute mark soaring, before Edmonton’s drums and McJohn’s organ take over, Byrom adding some stinging lead guitar throughout. The last minute of the tune finds the band rocking with female background vocals almost bringing Pink Floyd to mind, before Byrom closes out the tune with a few final hot licks from his guitar. 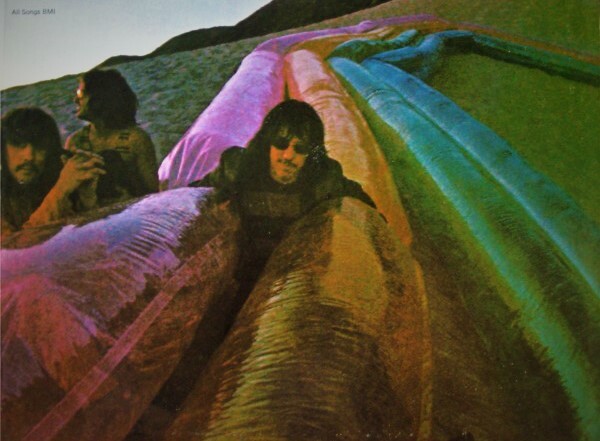 A most interesting mix of social commentary and hard rock, “Monster” sets the scene for future releases by the band, as gone are the psychedelic sounds of the first two albums, giving way to the harder edged guitar and organ driven rock that would be the “Steppenwolf sound” for the remainder of their ABC/Dunhill days. 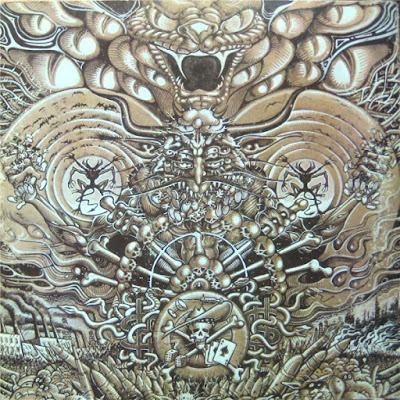 Side one is dominated by the heavily political opening medley but also contains the powerfully thought provoking tracks “Draft Resister” and “Power Play.” Side two contains the more accessible and commercial “Move Over” while the rest is devoted to the band doing what it did so well, settling into grooves and rocking up a storm. How the album failed to make the Top 10 is a mystery to me. 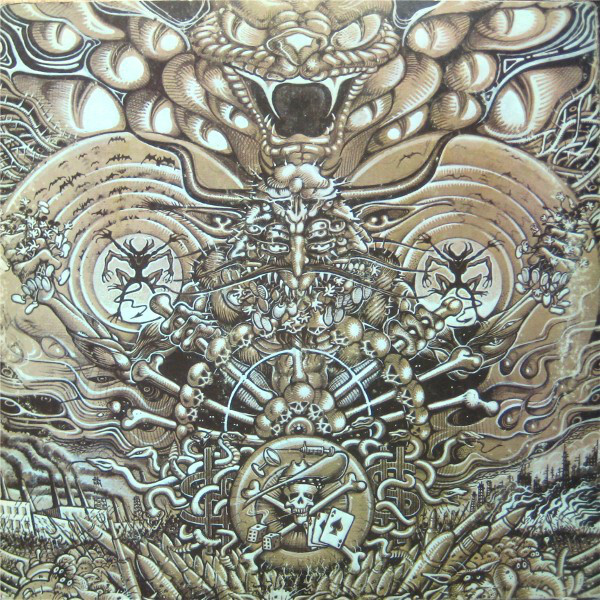 Perhaps the confusion created by the release of “Early Steppenwolf” was responsible. Or perhaps music buyers spoiled by the rapid fire release of the band’s first three albums were simply not patient enough to wait for the arrival of “Monster.” Whatever the case, it is certainly a fine album and yet another highlight of the band’s glory days at ABC/Dunhill. Fans would not have to wait long for a follow up, as Steppenwolf’s next release, the legendary 2 LP “Steppenwolf Live” would arrive only five months later, in April 1970 and will be the subject of The Steppenwolf Story-Chapter Six coming to you shortly. Another fine review. The lyrics mentioned further highlight why Classic Rock is timeless not just in music. Once again, you are most kind. Your words are greatly appreciated.